What do Buffalo Bill, Kit Carson, and Johnny Appleseed have in common? They’ve all appeared in children’s books by Andrew Glass. 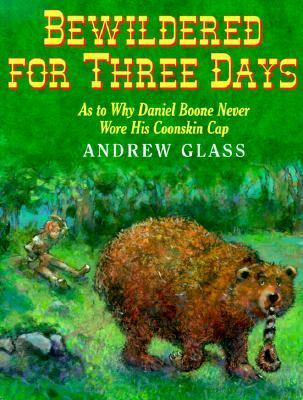 But in 2000, Glass turned his attention to Daniel Boone, the famous Kentucky frontiersman. Glass starts with a true piece of history – that Daniel Boone never actually wore a coonskin cap – then invents a tall tale that explains why! Writing about Indians is a delicate subject, but Glass finds a way to have it both ways. A young Daniel Boone farms a “hardscrabble” field with his brothers, they’re suddenly surprised by a tribe of Cherokees. Glass writes their “warriors burst through the trees, shrieking and waving hatchets.” But it turns out they’re friendly Indians, who have come to protect them from a more hostile tribe. “It was only a terrifying misunderstanding,” explains Daniel Boone’s mother. Glass’s illustrations are almost impressionistic, with bright colors, almost like an American Gauguin. It seems oddly appropriate for a story set in the mid-1700s. Glass mixes some real history into his tale, and soon the Indian’s son is telling Daniel Boon about a fertile farming land that waits beyond the dark mountains. And Glass drew a funny illustration of Boone waking in the woods, only to discover a hairy bear standing over him. In an author’s note at the end of the book, Andrew Glass admits that Boone probably just preferred wearing a wide-brimmed hat. But he thought a promise to raccoons would be more dramatic!